Gaming with motion controls is a fun, active, and intuitive experience, and nothing does it quite like Wii. With games that give you the feeling of playing your favourite sports activities and adventures that put a sword in your hand like never before, your own body's movements are used to interact with the games in fun and delightful ways – all thanks to the Wii Remote Plus controller in your hand. The Wii Remote Plus controller is the heart of the motion gaming experience on your Wii mini console. It responds to motion and rotation for enhanced control as you swing, swipe, thrust, or turn the controller. With Wii Remote Plus, your gaming experience becomes more active and immersive than you ever thought possible. Every Wii mini console comes packed with one red Wii Remote Plus controller, but be sure to pick up additional controllers to get more friends and family members playing together! Hook the Nunchuk accessory up to your Wii Remote Plus for even more flexibility in compatible games. The Nunchuk has similar motion-sensing technology, along with two buttons and a Control Stick. This allows you to move characters around while performing more specific and complex actions with the Wii Remote Plus controller. 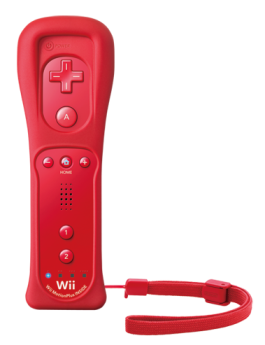 Every Wii mini console comes packed with one red Nunchuk, but you can buy additional Nunchuk accessories to get more players gaming together. Nunchuk available for sale in WHITE or BLACK. A range of other unique accessories provide all-new ways to play select Wii games, and enhance your experience even further. Whether you're having fun with fitness using the Wii Balance Board, racing with the Wii Wheel accessory, or looking for an old-school gaming experience with the Classic Controller Pro, there are lots of exciting options available! Head to our Accessories page for more information. Wii mini features easy-to-use parental controls that allow users to manage access to Wii game software based on age rating. Learn more about Parental Controls here.